In biology, meiosis is the process by which the number of chromosomes in a cell nucleus is halved during the formation of germ cells (eggs and sperm). Meiosis forms the basis of sexual reproduction, which increases the genetic diversity of the offspring. In meiosis, the diploid cell's genome, which is composed of ordered structures of coiled DNA called chromosomes, is replicated once and separated twice, producing four haploid cells, with each containing half (one set) of the original cell's chromosomes. Fertilization occurs when a male haploid cell and female haploid cell fuse together to form a diploid cell, which has two copies of chromosomes (one from each parent). This cyclical process in eukaryotes, called the "biological life cycle," occurs by means of sexual reproduction, which is characterized by separation by meiosis and genetic recombination through fertilization. Sexual reproduction is a near universal characteristic of living organisms, as is the differentiation of organisms into either male or female (or plus and minus). These features would appear to reflect the universal biological principle of dual characteristics or "polarity," whereby all existent beings contain positive and negative elements, and can themselves be seen as positive or negative in terms of their relationship with other existent beings. Meiosis is necessary for successful sexual reproduction. Meiosis uses many biochemical processes that are similar to those used in mitosis in order to distribute chromosomes among the resulting cells, but the outcome is very different. Mitosis is a process related to meiosis that creates two cells that are genetically identical to the parent cell. The general principle is that mitosis creates body, or "somatic," cells and meiosis creates the cells involved in reproduction, which are called "germ cells." Meiosis was discovered and described for the first time in sea urchin eggs in 1876, by noted German biologist Oscar Hertwig (1849-1922). It was described again in 1883, at the level of chromosomes, by Belgian zoologist Edouard Van Beneden (1846-1910), in Ascaris worms' eggs. The significance of meiosis for reproduction and inheritance, however, was not described until 1890 by German biologist August Weismann (1834-1914), who noted that two cell divisions were necessary to transform one diploid cell into four haploid cells if the number of chromosomes had to be maintained. In 1911, American geneticist Thomas Hunt Morgan (1866-1945) observed crossover (an exchange of material between two chromosomes) in Drosophila melanogaster meiosis and provided the first true genetic interpretation of meiosis. Meiosis occurs in all eukaryotic life cycles involving sexual reproduction, which is characterized by meiosis and fertilization. It takes place alongside normal mitotic cell division. In multicellular organisms, there is an intermediary step between the diploid and haploid transition, during which the organism grows. The organism will then produce the germ cells involved in the life cycle. The rest of the cells, somatic cells, function within the organism. The organism phase of the life cycle can occur between the haploid-to-diploid transition or the diploid-to-haploid transition. Some species are haploid instead, spawned by the proliferation and differentiation of a single haploid cell called the "gamete." Others are diploid, grown from a diploid cell called the "zygote," a cell that is the result of fertilization. Humans are diploid creatures. Human primordial germ cells (PGCs, a type of barely-pluripotent stem cell) undergo meiosis to create haploid gametes, which are sperm cells for males and ova, or egg cells, for females. These gametes then fertilize in the fallopian tube of the female before implantation in the uterus, producing a diploid zygote. The zygote undergoes progressive stages of mitosis and differentiation to create an embryo, the early stage of human life. There are three types of life cycles that utilize sexual reproduction, differentiated by the location of the organism’s stage. In the gametic life cycle, of which humans are a part, the living organism is diploid in nature. In human reproduction, the diploid germ-line stem cells undergo meiosis to create haploid gametes, which fertilize to form the zygote. The diploid zygote undergoes repeated cellular division by mitosis to grow into the organism. In the zygotic life cycle, the living organism is haploid. Two organisms of opposing gender contribute their haploid germ cells to form a diploid zygote. The zygote undergoes meiosis immediately, creating four haploid cells. These cells undergo mitosis to create the organism. Fungi and many protozoa are members of the zygotic life cycle. In the sporic life cycle, the living organism alternates between haploid and diploid states. This cycle is also known as the "alternation of generations." The diploid organism's germ-line cells undergo meiosis to produce gametes. The gametes proliferate by mitosis, growing into a haploid organism. The haploid organism's germ cells then combine with another haploid organism's cells, creating the zygote. The zygote undergoes repeated mitosis and differentiation to become the diploid organism again. The sporic life cycle can be considered a fusion of the gametic and zygotic life cycles. A diploid cell contains a full set of chromosome pairs, each pair containing one chromosome from each parent. These chromosome pairs are called homologous chromosomes. Homologous chromosomes need not be genetically identical. For example, one particular locus (location) on one of the father's chromosomes may code for blue eyes, while the same locus on the mother's chromosome may code for brown eyes. This genetic variety is the key to the power of sexual reproduction. Before division, the genome is replicated so that each chromosome now contains two identical copies of itself, called "sister chromatids," joined together by a region of DNA known as the "centromere." Each sister chromatid is not considered a chromosome in itself. Meiosis I, the first round of division, separates homologous chromosomes. Meiosis II, the second round of division, separates sister chromatids. There are four haploid cells produced at the conclusion of meiosis. This description suggests that two out of four gametes will contain the maternal set of chromosomes, while the other two will contain the paternal set. In practice, however, the gametes are genetically varied, containing a mix of both paternal and maternal genetic information. This is accomplished in two processes. 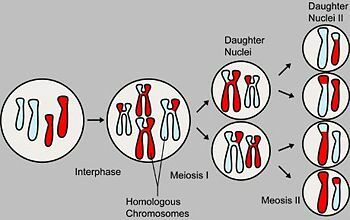 During meiosis I, genetic information is distributed through independent assortment, the independent segregation and assortment of chromosomes during sexual reproduction. Homologous chromosomes will eventually end up in separate cells. However, homologous chromosomes are oriented independently of their companions. That means that each daughter cell has a fifty-fifty chance of receiving the maternal chromosome or the paternal chromosome. At the same time during meiosis I, when the chromosomes pair up together for a short time through a phenomenon called "synapsis" before being separated, chromosomal crossover occurs. During this time, nonsister chromatids of homologous chromosomes may exchange segments at random locations called "chiasmata." The chromosome that is subjected to crossing over is then called a "recombinant chromosome." The diagram shown above summarizes the segregation of the meiotic chromosomes. Chromosomes that are the same size (one light blue and one red to show parentage) are homologous to each other. They are replicated before meiosis so that each chromosome contains two genetically identical sister chromatids (the vertical bars of the H-like structure). Crossing over occurs between nonsister chromatids of the two homologous chromosomes. Homologous chromosomes are separated in meiosis I. In this case, each daughter cell receives one recombinant mother chromosome and recombinant father chromosome. Meiosis II separates the sister chromatids. The final products of meiosis are four genetically varied gametes. Because meiosis is a "one-way" process, it cannot be said to engage in a cell cycle like mitosis does. However, interphase—the preparatory steps that lead up to meiosis—is identical in pattern and name to the interphase of the mitotic cell cycle. G1 phase: Characterized by increasing cell size from accelerated manufacture of organelles, proteins, and other cellular matter. S phase: The genetic material is replicated. G2 phase: The cell continues to grow. Interphase is immediately followed by meiosis I, during which one diploid cell divides into two haploid cells by the separation of homologous chromosomes, and then meiosis II, which divides two haploid cells into four haploid cells by the separation of sister chromatids. Meiosis I and II are both divided into prophase, metaphase, anaphase, and telophase subphases, similar in purpose to their analogous subphases in the mitotic cell cycle. Therefore, meiosis encompasses the interphase (G1, S, G2), meiosis I (prophase I, metaphase I, anaphase I, telophase I), and meiosis II (prophase II, metaphase II, anaphase II, telophase II). In the leptotene stage, the cell's genetic material, which is normally in a loosely arranged pile known as "chromatin," condenses into visible threadlike structures. Along the thread, centromeres are visible as small beads of tightly coiled chromatin. Recall that centromeres are connection sites between sister chromatids, which are not yet distinguishable. As the chromatin becomes progressively ordered and visible, homologous chromosomes line up and bind together. This process, synapsis, a protein structure called the "synaptonemal complex" attaches the homologous chromosomes tightly together all along their lengths. The zygotene stage sees the completion of synapsis. The paired homologous chromosomes are said to be bivalent. They may also be referred to as a tetrad, a reference to the four sister chromatids. During this stage, one percent of DNA that wasn't replicated during S phase is replicated. The significance of this cleanup act is unclear. The pachytene stage heralds crossing over. Nonsister chromatids of homologous chromosomes exchange segments of genetic information. Because the chromosomes cannot be distinguished in the synaptonemal complex, the actual act of crossing over is not perceivable through the microscope. During the diplotene stage, the synaptonemal complex degrades. Homologous chromosomes fall apart and begin to repel each other. The chromosomes themselves uncoil a bit, allowing some transcription, or copying, of DNA. They are held together by virtue of recombination nodules, located at the sites of previous crossing over, the chiasmata. Chromosomes recondense during the diakinesis stage. Sites of crossing over entangle together, effectively overlapping, making chiasmata clearly visible. In general, every chromosome will have crossed over at least once. The nucleoli disappears and the nuclear membrane disintegrates into vesicles. During these stages, barrel-shaped microtubules called "centrioles" are migrating to the two poles of the cell. These centrioles, which were duplicated during interphase, function as microtubule coordinating centers. Centrioles sprout microtubules, essentially cellular ropes and poles, during crossing over. They invade the nuclear membrane after it disintegrates, attaching to the chromosomes at the kinetochore. The kinetochore functions as a motor, pulling the chromosome along the attached microtubule toward the originating centriole, like a train on a track. There are two kinetochores on each tetrad, one for each centrosome. Prophase I is the longest phase in meiosis. Microtubules that attach to the kinetochores are known as "kinetochore microtubules." Other microtubules will interact with other microtubules called "nonkinetochore microtubules" from the opposite centriole. As kinetochore microtubules from both centrioles attach to their respective kinetochores, the homologous chromosomes align equidistant above and below an imaginary equatorial plane, due to continuous counterbalancing forces exerted by the two kinetochores of the bivalent. Because of independent assortment, the orientation of the bivalent along the plane is random. Maternal or paternal homologues may point to either pole. Kinetochore microtubules shorten, severing the recombination nodules and pulling homologous chromosomes apart. Since each chromosome only has one kinetochore, whole chromosomes are pulled toward opposing poles, forming two diploid sets. Each chromosome still contains a pair of sister chromatids. Nonkinetochore microtubules lengthen, pushing the centrioles further apart. The cell elongates in preparation for division down the middle. The first meiotic division effectively ends when the centromeres arrive at the poles. Each daughter cell now has half the number of chromosomes, but each chromosome consists of a pair of chromatids. The microtubules that make up the spindle network disappear, and a new nuclear membrane surrounds each haploid set. The chromosomes uncoil back into chromatin. Cytokinesis, the pinching of the cell membrane in animal cells or the formation of the cell wall in plant cells, occurs, producing two daughter cells. Cells enter a period of rest known as "interkinesis" or interphase II. No DNA replication occurs during this stage. Many plants skip telophase I and interphase II, going immediately into prophase II. Prophase II takes an inversely proportional time compared to telophase I. In this prophase, the nucleoli and the nuclear envelope degrade and the chromatids shorten and thicken. Centrioles move to the polar regions and are arranged by spindle fibers. The new equatorial plane is rotated by 90 degrees when compared to meiosis I, perpendicular to the previous plane. In metaphase II, the centromeres contain two kinetochores, organizing fibers from the centrosomes on each side. This subphase is followed by anaphase II, where the centromeres are cleaved, allowing the kinetochores to pull the sister chromatids apart. The sister chromatids by convention are now called "sister chromosomes," and they are pulled toward opposing poles. The process ends with telophase II, which is similar to telophase I. A nuclear envelope forms around each set of chromosomes, cytokinesis takes place, producing four daughter cells, each with an haploid set of chromosomes. Meiosis is complete. Meiosis facilitates stable sexual reproduction. Without the halving of ploidy, or chromosome count, fertilization would result in zygotes that have twice the number of chromosomes as the zygotes from the previous generation. Successive generations would have an exponential increase in chromosome count, resulting in an unwieldy genome that would cripple the reproductive fitness of the species. Polyploidy, the state of having three or more sets of chromosomes, may also result in developmental abnormalities, sterility, or lethality. However polyploidy is a prominent feature of many crop plant genomes and is illustrated to have increased their robustness (Baatout 1999). Most importantly, meiosis produces genetic variety in gametes that propagate to offspring. Recombination and independent assortment allow for a greater diversity of genotypes in the population. Meiosis is a system of creating diversity that allows a species to maintain stability under environmental change. The normal separation of chromosomes in Meiosis I or sister chromatids in meiosis II is termed "disjunction." Abnormal separation is called "nondisjunction" and results in the production of gametes that have too much or too little genetic material. Nondisjunction is a common mechanism for trisomy (the presence of an extra chromosome in each cell) or monosomy ( the loss of one chromosome from each cell). Nondisjunction can occur in the meiosis I or meiosis II phases of cellular reproduction, or during mitosis. In females, meiosis occurs in precursor cells known as "oogonia" that divide twice into oocytes, female gametocytes. These stem cells stop at the diplotene stage of meiosis I and lay dormant within a protective shell of somatic cells called the "ovarian follicle." Follicles begin growth at a steady pace in a process known as folliculogenesis, and a small number enter the menstrual cycle. Menstruated oocytes continue meiosis I and arrest at meiosis II until fertilization. The process of meiosis in females is called 'oogenesis." In males, meiosis occurs in precursor cells known as spermatogonia, which divide twice to become sperm. These cells continuously divide without arrest in the seminiferous tubules of the testicles. Sperm is produced at a steady pace. The process of meiosis in males is called "spermatogenesis." Baatout, S. 1999. Molecular basis to understand polypoloidy. Hermatology and Cell Therapy 41 (4): 169-7. This page was last modified on 1 August 2010, at 19:25.